Image caption When Charlotte Peart told husband Daniel about the win he "didn't believe her at all"
A woman who pranked her husband by claiming she had won £250,000 on the lottery won £1m three weeks later. Self-employed carpenter Daniel Peart, 27, did not believe Charlotte, 28, from Peterborough, when she called him to tell him of the win. 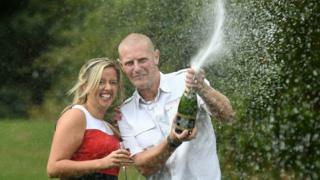 She had matched five numbers on EuroMillions HotPicks in the August 28 draw. "I didn't believe her at all because we like to wind each other up," Mr Peart said. He said it was only when his wife sent him a screenshot of the winning message that he realised it was true, and was "stunned". Mrs Peart said her husband told her "I can't talk to you right now love", and then "ended up putting his brother on the phone." "It was definitely crazy and not a normal day," she added. Mrs Peart used the last £1.50 in their online lottery account to enter the draw. The couple, who have three children together and own a three-bedroom home in Whittlesey, near Peterborough, are planning to buy a larger property in the area. "With a family of five it gets a little cramped," Mr Peart said. "All the kids have earned their own bedrooms, they're all excited about that and we're looking forward to the next adventure in our lives." "The biggest thing for us is we get to spend more time as a family and we don't have to worry so much as what we're used to now," he added.